OTT Cable Way Systems - HYDROMETRICS s.r.o. OTT cable way systems provide safety where mobile discharge measurements in water or from a bridge cannot be performed. They are driven mechanically or electrically and are available for span lengths of up to 160 m. The systems are DEKRA type approved and meet all applicable safety requirements. The components do not require any maintenance; lubrication or oil changes are not necessary. Corrosion-resistant, slim, and sturdy pulley block made of cast aluminium – no risk of cracking because of welded seams. Increased safety provided by overload clutch – the current meter cable is unwound in case of excessive load, e.g. when the instrument got caught. 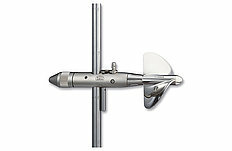 Automatic stop when an end position is reached or the ground is hit – simplifies instrument control. Optical and audio alerts in case of ground contact; Diagnostic features and alarm information. All designs of the OTT cable way system are available for mechanical or electrical drive. Moreover, you may choose whether the winch is to be operated from the right-hand or left-hand side. Typically, OTT cable way systems are installed by the OTT HydroService department. Our specialists are well-trained for this job and use the appropriate equipment. Thus they are able to ensure careful and safe installation. All components of the OTT cable way systems are maintenance-free. However, regular inspections by authorised experts are mandatory in many countries in case of cable way systems for hydrological service. OTT HydroService performs these inspections in a reliable manner and does any service, replacement, or adjustment operations efficiently and professionally.